This level has hard difficulty and you need to use good trick to get 800000 points within 45 seconds. For this level you should try to play near to blockers and use time bonus candies. 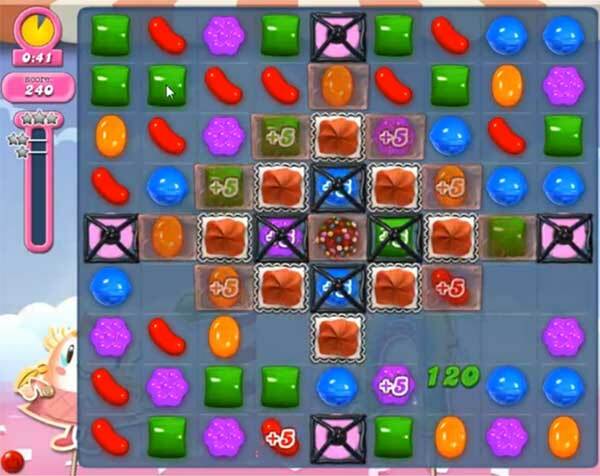 Try to combine special candies with normal candy instead of other special candy as it could waste the time. I agree with everyone. This level is not done by 45 seconds. I am so fed up playing this game. For me i reach a high level, so i am proud. To reach more? I am not interesting. I got more than 823.000 and I Did not get this level. Down underwith this game. Play further with a not king game. It seems I am not the only one. Give me hope not playing this game anymore. Good for Candy crush saga, i am stuck on level 880, good work but i quitt . I am farther than most oF my friends in this game But. .. Enough is enough. I am satisfied reaching this level, good luck everyone But. . Beter stp this game. Volg alleen nog facebook, een stuk leuker dan deze sh**. I have had so much trouble with this level. I have gotten over 1 million points and it still says I have failed the level. Don’t understand why. What am I missing? Surpassed points several times in level 880. Game indicated I cleared the points however the game indicated a bomb was about to explode. Since over the 800008, I should have been advanced. Something has to be stuck. I agree with the sarcasm. This timer keeps running, but we cannot make the next move until the game catches up. I’ve also cleared the board of all extras, but haven’t broken 500k. I personally believe this one is a sham intended to make players pay to gain enough time to win the level. I did buy more time because I was so close. but time had run out and when I bought more and passed the 800+ mark I still didn’t get past it because I didn’t do it in 45 seconds, I did it with added time!!!!! I hate it. Came on here looking for help but not finding any. I am a novice at this game and did it easily after four tries! I have arthritis in my hands and cannot do timed games very well. So annoying!!!! Its easier than you think, focus on yhe bombs,keep putting them out. Don’t let them get to low. Don’t worry about the time clock its your friend. Won in 6 games. Have fun you have come tp far. I far reached the 880,000 and over. Game said “failed”, don’t understand! Very frustated!!!!! This is the hardest level to beat. What I don’t understand is I had well over a million the other day, and just out of the blue it shows an error message that the bomb is about to explode. The level was to be won with a bit over 800,000, so what gives? I see no way to beat it, virtuously impossible. Terrible level. I will now delete candy crush and I have been through some tough levels, the one prior for example. Here is what I have observed: I don’t always get the points when I crush multiple plus fives, Sometime I only get two points when I should get 15. Also getting two coconut wheels, cleared the whole board, but would not spin out more plus fives, lots’ of bombs,but the clearing of the board, and no chance at fives has the game over prematurely! Don’t quit! I played it about a dozen times not getting over 500,000 and just now, out of the blue, things just clicked and I beat it! Keep trying, you can do it too! Clock keeps winding down before coconut wheels get through. King needs to do something about this, if they want people to keep playing. Spent too much, no more! I can’t get the clock to wind down. The last two nights I have reached over 8m points over 2-3 hours. The clock never gets below 24 seconds. I reach the maximum score needed and have even let a bomb go off and I end up losing the game. My candy crush level 880 is only 1000 points and u have to drop a cherry and an acorn down with the track in the middle. The cheat shows a different game for 880. What gives?? ?